The entire time I was making this dairy-free spinach-artichoke dip the above line was going through my head. I’m not sure how many of you remember “The Little Rascals” but it was a show I used to watch all the time growing up. I LOVED Stymie, Alfalfa, Darla and, of course, Spanky. In this scene, Stymie is given a fine meal to try. He doesn’t know what an artichoke is but he’s “gonna tackle it”. Clearly, artichokes can be a bit intimidating. The good news is this recipe, while featuring artichokes, presents none of the associated confusion. We are going to stick with the artichoke hearts and make our lives easier. Whew! My husband G and I made this spinach-artichoke dip on New Year’s Eve. We had some leftover corn chips from our traditional Christmas Eve Tortilla Soup. (Yes, I realize corn chips are not paleo. But they were gluten-free so it was a splurge.) We cut up some cucumbers and tried the dip with both. Two years ago I probably would have preferred the corn chips with the dip. But this time we found ourselves favoring the cucumbers! It was a bit surprising but I guess our tastes have really changed. Not to say I don’t enjoy corn chips now and then but they are definitely not something I crave. It was a nice confirmation of how changing the way we eat can build on itself in altering our tastes for the better if we stick with it. 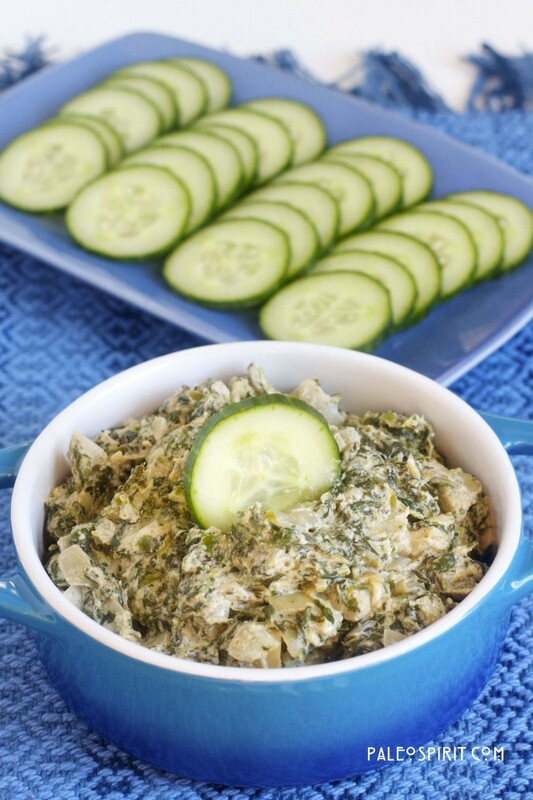 The paleo spinach-artichoke dip uses my newly found favorite ingredient: cashew cream. 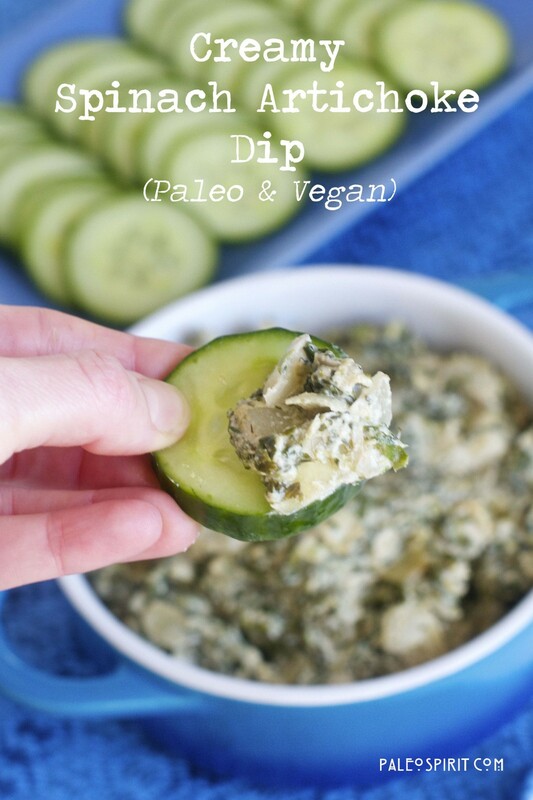 It gives the dip that creamy taste you want without using dairy products. We have made this twice in a week. I hope you enjoy it as much as we have. Defrost the spinach and squeeze out the excess water. Set aside. Sauté the onions in the olive oil until translucent, about 10 minutes. Add the minced garlic and cook for another minute. Stir in the chopped artichokes, salt, onion powder, garlic powder, black pepper and cayenne and heat through. Add in the spinach and lemon juice and stir until heated through. This dairy-free spinach-artichoke dip is best served warm. We enjoyed it with slices of cucumbers and red bell peppers because they were good for scooping. It would also be great with some grain-free crackers and/or different veggies. 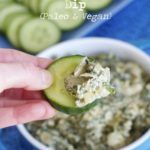 48 Responses to "Creamy Spinach-Artichoke Dip (Paleo & Vegan)"
I was wondering if something else could be used instead of the raw cashew cream? Perhaps full fat coconut milk? If not I’ll give the cashew cream a try. I have family coming over next weekend and I would like to make this dip. However, I have so much to do that I was hoping to possibly skip the cashew cream making step to make my job easier. Let me know! Thank you! Hmm. I’m not sure about the coconut milk. It’s possible if it is really thick. It would definitely give it a coconut flavor which I’m not sure you would want in this dip. The cashew cream has a more neutral flavor. I had never made it before because it sounded intimidating but as long as you give yourself some time in advance to soak the nuts it’s not that hard. Of course, this also assumes you have a food processor that can do the work and I know not everyone has that. I’m allergic to cashews. Could I use almonds to make the almond cream? You probably could. You would most likely need to use blanched almonds so there’s no skin. Please let me know if you try it. I’m not sure where you got that idea. Just made this awesome dip, but…added Sunny Paris seasoning from Penzeys spices. Delicious! 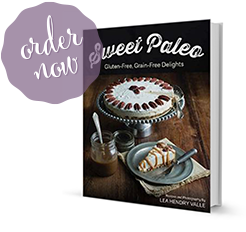 Thank you for the Paleo chocolate chip cookies…we are in love with the coconut nectar and your web site. Can’t wait to try more of your receipts. Thank you, Shelley. I’m glad you liked it. In an effort to make some major changes in our eating habits this year, we’ve learned so many cool tricks and substitutions, but I think cashew cream is my absolute favorite! Thanks for the recipe. It was delicious. This recipe was phenomenal! I made it for my healthy moms group potluck and there was none left 🙂 thank you!! Didn’t even miss the cheese! Trying this recipe wasn’t a good idea! I AM ADDICTED!!! Oh my gosh…this stuff is Amazing!!!! Thank You so much for sharing this creation. Can’t wait to share it with the family for Thanksgiving. This might be me in a few hours. Doing a trial run and if it passes muster, I will make another batch and bring to a Super Bowl watch party. I love cashew nut butter, so now that I’ll learn about cashew cream…… Watch out! Holy cow…I just made this and it is INCREDIBLE. I made half a batch (to test, and I am just one person household). I may have added more spices but otherwise this was perfect and amazing. This is my new favorite recipe. Thank you for sharing!! Cool, Marisa. I’m so glad you liked it! I’m planning on making this for a Thanksgiving app. Can I use fresh spinach instead of frozen? Sure, just make sure you get roughly the same amount. Good luck. I love this recipe. Hi, I’m thinking of doing thing but substituting the cashew cream for vegenaise? Any one used it before and done it for this recipe? Made it for Thanksgiving and everyone loved it and just had a request to make and bring it to our family Christmas Eve get together. This is a keeper! Thank you for the recipe! I just made this dip for Christmas and it was amazing! Everyone loved it and couldn’t even tell there was no dairy. Woo hoo. Success! Thanks for letting me know. This turned out so well! I took this to a party and had many fans. 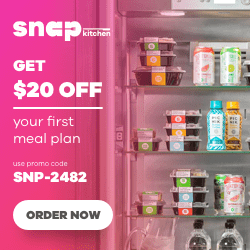 I will be sharing your recipe! Thank you! Great Sheila. Thanks for letting me know! I successfully made the trial batch. First the bad news…. I ate it after dinner. The good news is…. I ate it after dinner. Otherwise, I would have eaten all of it!!!!! Ha ha. Great story. Glad you liked it! This looks great and the cashew cream would be another trick to try with my new Vitamix. I am thinking about bringing this to a SuperBowl party and wondering what do you suggest to warm the dip? A crockpot on Keep Warm? I haven’t tried warming in a crock pot. I find it does require gentle reheating as the cashew cream tends to dry up quickly if heated too much/too intensely. If you don’t like to use a microwave you can just reheat on the stovetop. But if you make a lot and/or want it to stay consistently warm the crock pot might be great! I look forward to trying this recipe! I am sensitive to cashews, so I may try plain goat cheese instead. May not be exactly paleo, but at least tolerable for me! 🙂 Thanks for the idea! You’re welcome. I love goat cheese and that combination sounds amazing! Thank you for this recipe and the cashew cream!!! I am throwing 2 baby showers back to back and need to prep stuff ahead of time. I am going to make the cashew cream early this week and throw everything in a crockpot the night before. Thanks so much! Great idea! Have fun at the showers. 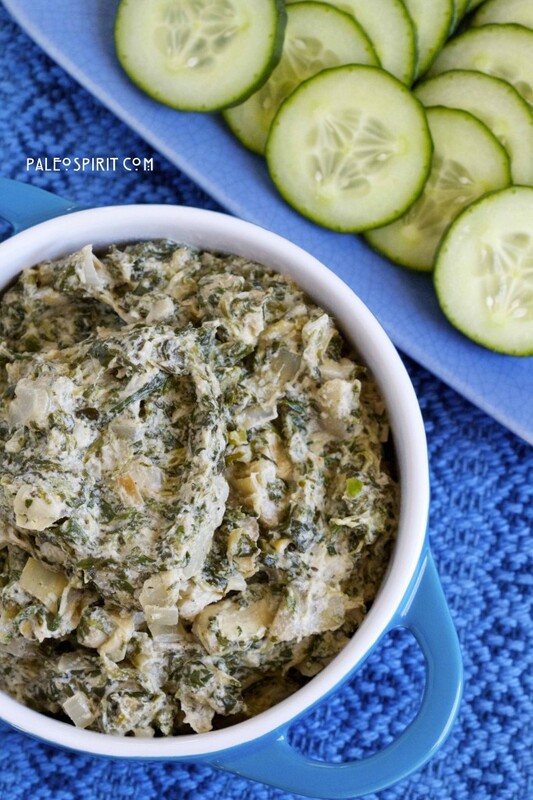 I just found this recipe, a little too late…I am on an autoimmune protocol similar to paleo and this morning I made an artichoke/spinach dip using homemade mayonnaise as the creamy ingredient. If you tolerate eggs, it might work for this recipe (which I will try next time!!). My daughter is allergic to nuts…what would you recommend in place of the cashew cream? Sunflower seeds? Pumpkin Seeds? what? It is possible to use sunflower seeds to make sunflower seed sour cream. I think you can substitute them in the same amount as the cashews. I must admit I have not tried it but have read it works pretty well. If you do decide to give it a whirl I hope you will comment here again to let me know how it goes. My older son is allergic to nuts too and it would be nice if I could make this in a way he could eat it. The minute I saw this recipe on Pinterest, I was sooooo excited. Everything about this hit me the right way, and I eagerly penciled it into my weekly menu and pretty much looked forward all week to getting to make this and eat it. I halved the recipe to make 2 servings, but rather than serve it immediately out of the skillet, I divided it into two cute ramekins, sprinkled some paprika on top (a tip my grandmother taught to make anything look prettier haha), and stuck them in the fridge until I was ready to eat them. Then, when I wanted one for dinner, I popped it in the oven with some foil on top and let it reheat until it was creamy and wonderful again… And ate it with anything I could stab into it! Carrots, red bell pepper, cucumber, celery… Anything that could potentially be a vehicle to get the deliciousness into my mouth. All I have to say is: Yuuuuummmmmm!! And: Such a good idea to divide up the servings; otherwise I would have eaten all of it in one sitting! Thanks for sharing such a great, paleo-friendly & vegan-friendly recipe 🙂 Totally made me week a little happier! About how many people does recipe recipe serve? Also I am AIP so I might try my version with full fat coconut cream with nutritional yeast added! The recipe makes about 3.5-4 cups of dip so how many it serves depends on how much people are eating. Some people eat it almost as a side dish. I think using coconut cream instead of the cashew cream would make for a thinner end product but I’ll be curious to hear how it turns out for you. Oh my oh my oh my! This is GOOD. Thank you so much for sharing this tasty recipe with us. Be blessed! I am so glad I found this recipe! I was craving a delicious snack for the Super Bowl while doing the AdvoCare challenge and this is perfect! So good you wouldn’t know it was healthy! Ps Don’t be intimidated by the cashew cream! I just made this recipe! I’m in love with it. I wasn’t sure about adding the lemon in it. But I sure am glad I did. It was really tasty. Going to freeze them in little trays to have as a snack with veggies! I have made this so many times & it’s always a delicious hit. Thanks so much for making a dairy-free ‘healthier’ EASY recipe!! You’re welcome. So glad you like it!